Website designing profession is estimated to be one of the highly growing IT professions in the world with so many designers, programmers mushrooming in all corners of the world. But a question comes back to you the designer or programmer ……………… are you doing what it takes to deliver excellent work? Do you give valued services to the clients? 1. Understand the type of business you’re designing a website for. Is the website for commercial business, non-governmental organization, governmental body, a magazine or it’s a social networking site? What are the client’s expectations from that website? Someone can only tell how beautiful your website will be at completion when he/she looks at sketch or layout. You must think it through before getting down to coding. I personally do my layouts on paper when I have a very tricky, hard to design website, mostly when it holds lots of content…….it works for me. I don’t know about you. But all in all you must come up with sketch or Layout. Think of the languages to use when designing. Decide if the website will be dynamic (database driven) or Static. Decide if a website will have scripts. Pick the suitable colors, fonts for that website. 3. Navigation or menu: What makes a website simple, smart, systematic, friendly and traffic attracting is the navigation or the menu. Whenever you design a website and users have to look a menu as if it’s a hidden treasure, then you’re bound to chase all the people away. Always make sure your menu is the position someone can easily read it. A menu should come from the client’s content. Avoid using words that users have to get a dictionary or visit Google to understand them. Give your navigation a very clear font and color. If you have dropdown menus, make sure they are user friendly. Scripts used must be error free. If your menus have hover colors or pictures, make sure the words are clearer than the background. Use readable fonts and browser friendly. Fonts like verdana, Tahoma, comic sans and many others as per your preference. Avoid using so many different font types. Use standardized fonts. I mean fonts that are at most in all operating systems, applications, web browsers. 5. Optimized Images or Graphics: Like they say images speak a lot of words. Nicely designed, optimized images make a website look very professional, download fast and attract a lot of traffic. Heavy images or graphics. (Try to optimize the images using any graphic software like Macromedia fireworks, Adobe illustrator, Photoshop and many more out there. Always think small, since we have so many broadband users and some how dialup users, very slow downloading pages are so annoying and are really a turn off. So avoid that to happen on your website and try to optimize your images. Avoid blinking, flashy, over rotating graphics. Always too much of anything is bad hence limit those annoying blinking images. Always provide an alternative text ALT at each image. 6. Search Engine friendly: You must focus on how users or search engines will find the newly designed website. Pick out major keywords from the website content. Those keywords are always put in Meta tags in the header. Make sure keywords in Meta tags are not repeated. Always choose what will be your title …must be something easily grasped or cached by the search engine. Use optimized images that are search engine friendly. 7. Color: Color says a lot about the website, who designed it, who owns it and what particular group of people it’s targeting. Background color, font color, heading colors all must be balanced very well to avoid color crash. Color schemes are very important. Color scheme matters a lot. Always focus what a user or visitors will see not what you see (always). 8. Testing: Always have your work looked at by either your workmates or friends. Try out your newly designed website in different web browsers, operating system environments, and different screen resolutions. It is time we do things by ourselves but we have to first learn how they work , I hate copying and in Uganda that seems to be the norm of the day , from buildings ,malls, business people copy each other . Let us start from simple things why hire I know some times it’s a necessity but we have to do it ourselves. Enough of the crap let get back to business let us build something. Get hold of your favorite components and let us start to assemble/install them to get your monster rig up? Do not worry, this guide will help you begin from scratch and give step by step instructions so that you can get your new PC up and running in a short amount of time. So here we go! How-to share a broadband internet connection on more than one computer. Am assuming you have a broadband link that you want to use in your office or at home on more than one computer, right? If so, you’re just in the right place for great tips on how you can have that internet connection shared among the computers you have. First before we move on sharing internet connection, answer the questions below? How many computers are to use that broadband internet link? Do you have a network cable or patch code? If computers are more than one do you have a hub or switch around? Atleast one with eight ports (it can be any brand CNet or D-Link, or Cisco switch or Wireless router.). Confirm that your computer has network card, atleast one. But if your broadband connection is using the existing network card I suggest you purchase another network card so that you have two because we shall use that other one to connect the rest of computers onto internet. 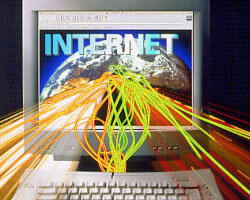 Read more: How-to share a broadband internet connection on more than one computer. Are you tired of your current internet service provider-ISP? You what to switch to another one you had on adverts? Well, when switching to another ISP you should first consider taking a survey on all the different ones available on the market. Make sure the one can meet your needs. I decided to compile a few tips that will help you make an educated decision instead of just jumping into a service agreement with an ISP that has glittering bells and whistles. For those that like an email application program with nice graphics, more features and better presentation of your emails then Microsoft outlook is a way to go. With Microsoft outlook, setup is a little bit different from that of Microsoft outlook express. Follow the steps below to have your emails downloaded using m/s outlook. Read more: HOWTO SETUP MICROSOFT OUTLOOK.